Today, for this Palm Sunday, I was able to witness and take part in making these words come alive. A couple of weeks ago, I was contacted by First Presbyterian Church for a special request. 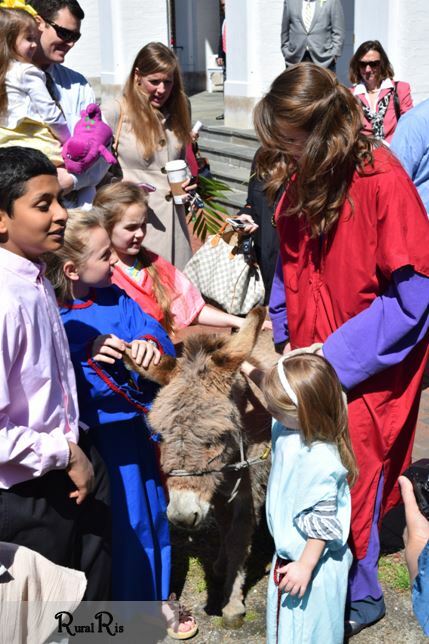 They wanted to know if I would be willing to bring my donkey to the Palm Sunday service. I had done this once before for another church several years ago, and really enjoyed it, so of course, I said yes! We worked out the details, and April and I were set to go to church. Yesterday, I caught April and washed her. 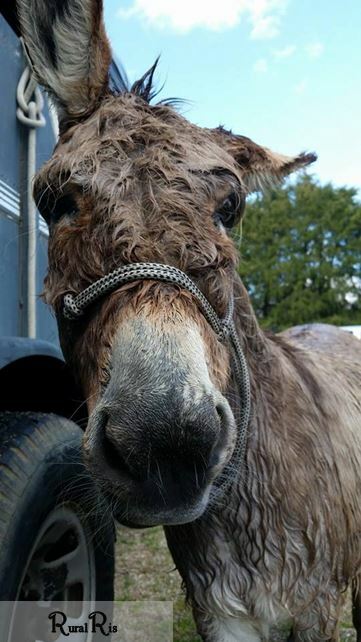 She was none too pleased at being wet. I must admit, it was a little nippy. She did enjoy the scrubbing part, though. I made sure to hit all of her itchy spots. After getting all of the hay and dirt out of her coat, I tied her up to dry. Her friends, (Mirage, her grown daughter, and Firefly, our little rescue pony) lined the fence to watch what all was going on. Every now and again, April would stomp her feet in protest at the indignity she was enduring. Don’t let her fool you completely; she got treats galore. I locked her up in a stall for the night, so she wouldn’t get dirty. The next morning was showtime. Garrett graciously agreed to drive down to be my chauffeur and assistant (he’s a great boyfriend). I was a bit nervous for the day, to be honest. I didn’t doubt that April would behave, but at the same time, she is an animal, and they have a mind of their own. I was just praying she wouldn’t relieve herself inside the church. Yes, April would be going inside the church–in the sanctuary. Now you see why I was a bit nervous (even though, the last time she held her bowels). Upon arriving, Garrett and I met with various members of the church. They made us feel right at ease and were incredibly enthusiastic about us being there. That made me even more excited and definitely less nervous. They handed me a Biblical costume and asked Garrett if he wanted to dress up too. Garrett, being Garrett, is always up for anything. Amazingly, they found a costume that went below his knees (he is 6’7″ tall). After getting dressed, we walked through the route that we would be leading April down. She would walk up a ramp, through some doors, into the sanctuary, down the aisle and back out. Simple enough. Garrett and I went outside to take April for a walk to get the jitters out of her. She let out one bray to announce her presence, but was very quiet otherwise. We slipped her carrots here and there for reassurance. I think she thought it was worth it for the orange sticks. Soon, it was time for her grand entrance. I walked her in the doors to a foyer area. Inside were a lot of excited children dressed up, holding palm branches. April took it all in. She wasn’t entirely sure about the slick marble flooring, but didn’t make a big deal out of it, especially with carrots on her mind. Garrett stood behind her and slipped me carrots to give her. Music began to play, and our cue for entering began. We followed Rev. Leigh down the aisle as she laid palm branches as she went. April made me tug a little bit to get her in the large room filled with people, but soon pranced on. She cracked me up in regards to the palm branches. She dodged every single one, weaving in out of them, avoiding stepping on them. Who knew she would prefer red carpet over green leafy stuff. The children filed in behind us and went to their places at the front of the church. April and I stood in front of them so parents could get a few pictures. One little girl came over to love on April while everyone was singing. When the song ended, Garrett, April and I walked back out the way we came. I breathed out a sigh of relief that I hadn’t needed to use the shovel in the trailer. No poop today. Hurrah!! We put April back in the trailer and slipped back in the church to hear the lovely sermon and the kids sing. 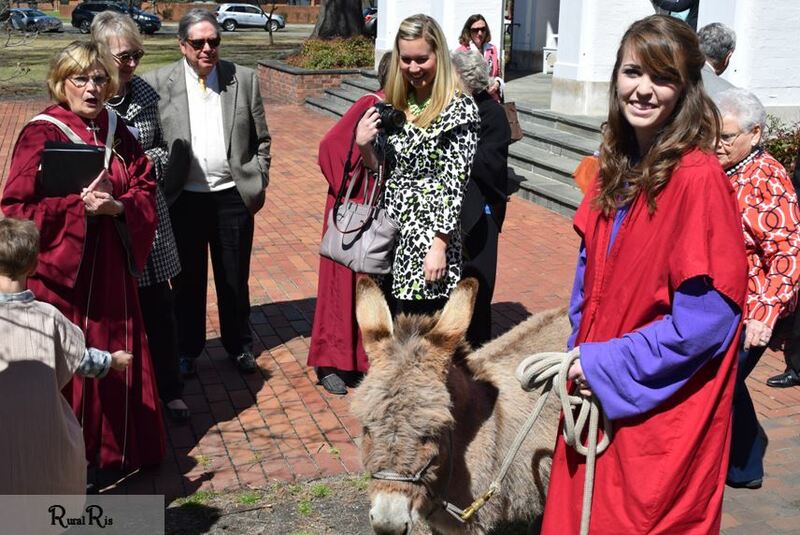 It was really nice, and the sermon went perfectly with the presence of the donkey and it being Palm Sunday. After the service, we took April back out so everyone could meet her. 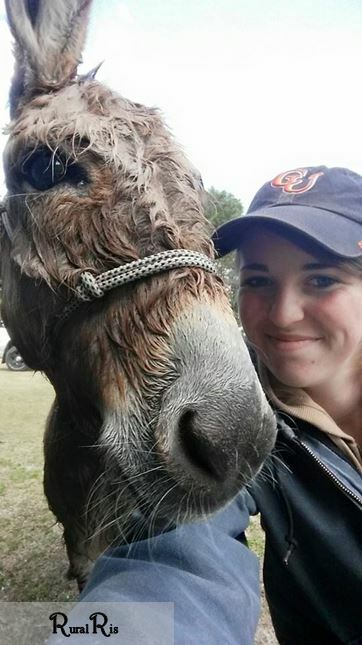 I could not ask for a more patient donkey. She was surrounded on all sides by people and a multitude of hands touching her at one time. She just stood there, looking left and looking right. Even when her tail got grabbed, she only took one step forward. She really was perfect. I was so glad the day turned out to be such a success. I had faith in April (otherwise I wouldn’t have brought her) but she being an animal, you never know. I was most worried about stinky accidents. All went well, and she smelled nice from her bath. She made a lot of people smile, and made a timeless and poignant story come to life. She even got a few carrots out of the deal. I think one of the things that resound with people most is the presence of the cross on April’s back. Legend says that the donkey that carried Jesus into Jerusalem on what we now call Palm Sunday, loved him so much that the little donkey followed Jesus to Calvary. Filled with grief at the suffering of his Lord on the cross, the donkey turned to leave, but could not. It was in that moment that the shadow of the cross fell upon the donkey’s back. 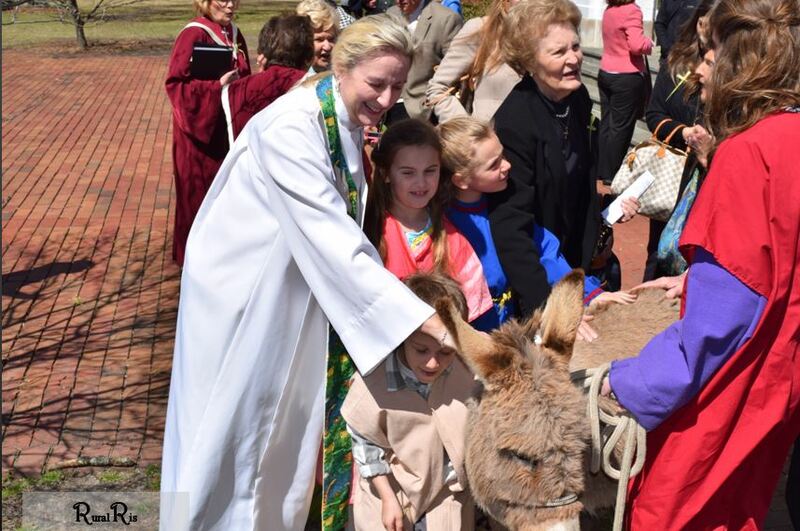 Ever since then, donkeys have borne the mark of the cross as a reminder to us all what Jesus did for us on that day–died so that we may go to heaven. April, like many other donkeys, share this same symbol of love. I hope you all had a wonderful Palm Sunday; however, I’m not sure it could get much better than mine. I am so grateful for the folks at First Presbyterian for making us feel welcome and exhibiting such excitement. I am glad I got to be a part of such a special day. I hope you remember the legend of the donkey, especially as Easter approaches. 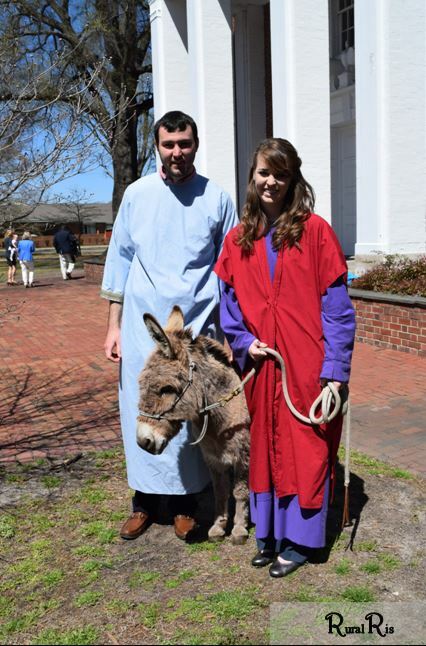 You and Garrett and April added such excitement and special meaning to our Palm Sunday at First Presbyterian in Goldsboro. Thank you for your willingness to share a living reminder of the little animal who carried Jesus into Jerusalem. 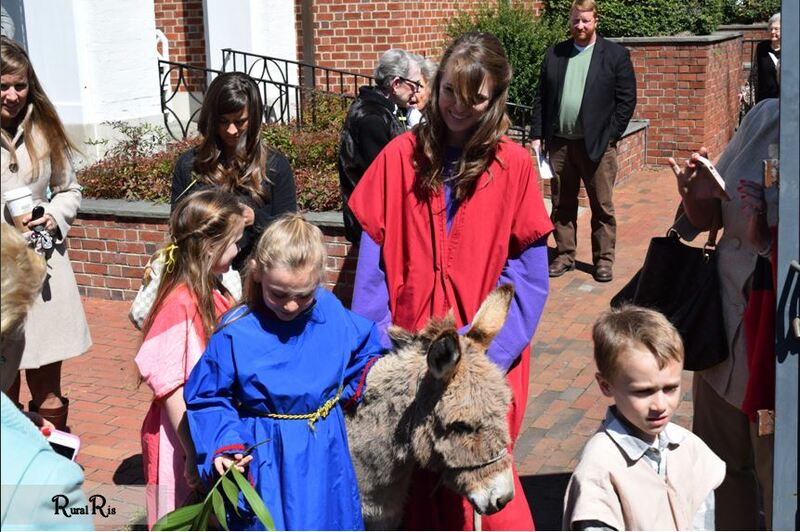 The sermon challenged us to think about the owner of the donkey, who willingly handed his animal over when told that the disciples’ Master needed it. Do we have our own “donkeys” and do we willingly share or give them up when the Lord finds a need for them? I doubt our children (or adults) will ever sing a “Hosanna” again without remembering little April and picturing our Lord , riding into Jerusalem on a donkey’s back as a very non-traditional kind of KING. Marisa, thanks again to you and Garrett and April for being part of our special Palm Sunday celebration, and thank you for telling the legend of the cross shape on April’s back–what a beautiful part of God’s creation to remind us of the shadow of the cross! .